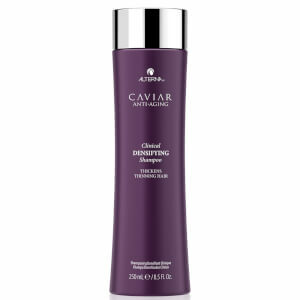 Alterna CAVIAR Anti-Aging Replenishing Moisture Shampoo is a luxurious, sulfate-free cleanser that restores nourishing moisture to dry, damaged strands for instantly younger and healthier hair. 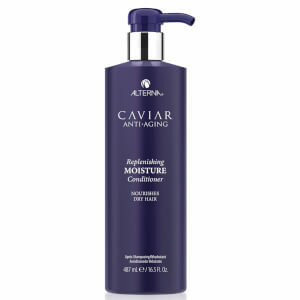 With a progressive blend of technologies including Seasilk®, Age Control Complex®, Enxymetherapy®, and Color Hold®, you are sure to see a notable improvement in your hair's shine, texture, softness and manageability when using this moisturizing shampoo. 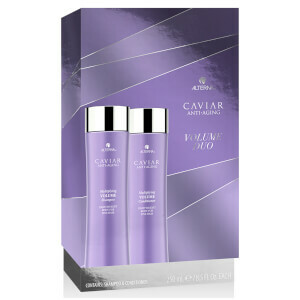 Water (Aqua), Disodium Laureth Sulfosuccinate,Sodium Cocoyl Isethionate, Sodium Lauryl Sulfoacetate, Cocamidopropyl Hydroxysultaine, Sodium Lauroyl Sarcosinate, Cocamidopropylamine Oxide, Acrylates Copolymer, Methyl Gluceth-20, Glycol Distearate, Glycereth-26, Algae Extract, Amodimethicone, Saccharomyces/Magnesium Ferment, Saccharomyces/Copper Ferment, Saccharomyces/Iron Ferment, Saccharomyces/Silicon Ferment, Saccharomyces/Zinc Ferment, Phospholipids, Soy Amino Acids, Sodium Phytate, Polysilicone-15Linum Usitatissimum (Linseed) Seed Oil, Helianthus Annuus (Sunflower) Seed Oil, Hydrolyzed Vegetable Protein PG-Propyl Silanetriol, Glycerin, Laureth-9, Caviar Extract, Butyrospermum Parkii (Shea) Butter, Ascorbic Acid, Superoxide Dismutase, Polyquaternium-10, Trideceth-12, Tocopheryl Acetate, C12-13 Pareth-3, C12-13 Pareth-23, Divinyldimethicone/Dimethicone Copolymer, Lauryl Alcohol, C11-15 Pareth-7, Butylene Glycol, Polyquaternium-7, Decyl Glucoside, Dihydroxypropyl PEG-5 Linoleammonium Chloride, Guar Hydroxypropyltrimonium Chloride, Citric Acid, Disodium EDTA, Aminomethyl Propanol, Isopropyl Alcohol, Tetrasodium EDTA, Alcohol, Potassium Sorbate, Polyaminopropyl Biguanide, Benzoic Acid, Phenoxyethanol, Methylisothiazolinone, Fragrance (Parfum).